Although West Bromwich Albions common nickname now is The Baggies they were originally known as The Throstles, we will come back to The Baggies origins later but firstly we’ll explain the fairly simple reason why West Brom named themselves after a bird more commonly known as a Thrush !! Its all to do with the fact that the Throstle (aka Thrush) was a common sight around the ground in the early days (rumour has it one was seen perching on the crossbar during one game!!) so the club adopted it as their emblem, the nickname Throstles quickly followed. 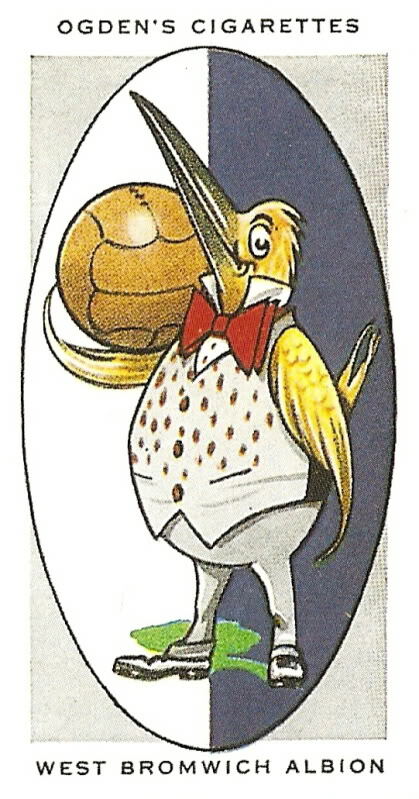 "In the early days of West Bromwich Albion - the club started about 1879 - a Throstle (or Thrush) perched on the cross-bar of a goal was adopted as a crest. These speckled birds were numerous in the vicinity of the ground and the choice was a happy one. The crest now in use is a throstle in a hawthorn bough, thus incorporating the name of the ground. 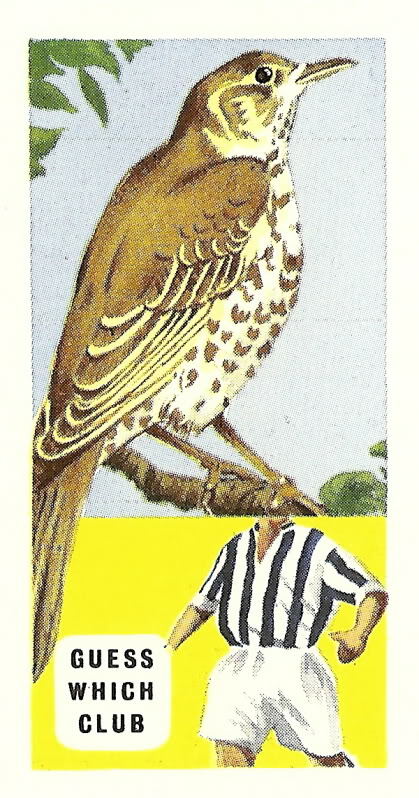 On match days a thrush in a cage is hung in front of the stand. The Throstles have a distinquished record, having reached the Cup Final seven times, winning it on three occasions. They have won the First Division Championship once, and the Second Division Championship twice." "When this club was first formed it is understood that Thrushes were prevalent in the West Bromwich area. 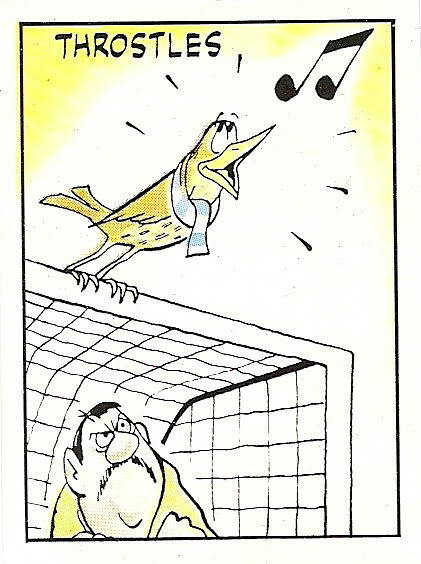 The nickname Throstles is taken from the birdThrush, and the name has come to stay as West Bromwich Albions nickname." So that explains the Throstles, on now to the Baggies which actually isn’t as recent as some people believe, first being heard in the very early 1900’s, a few theories surround its origin. As with most nicknames there is no definitive answer but the theories include the style of shorts worn at the turn of the century, which of course were baggy. Another form of clothing wear accounts for another theory in as much that local ironworkers used to go to the matches in their protective trousers, these trousers are also thought to have been the subject of derisory taunts by Villa fans which may have led to the Albion fans turning the insult around. Finally, and going back to the Throstle nickname, the cartoon above is Paninis take on the West Broms original football nickname, this sticker was part of the Panini 86 sticker series. This sticker, and the cigarette cards, can be purchased on our Footybitssite where they have been mounted in a clear fridge magnet.